If you’ve attended an event at the Anchor Brewery over the past few years, chances are you’ve tried one of the delicious flavors of beer ice cream created by San Francisco’s own Humphry Slocombe. 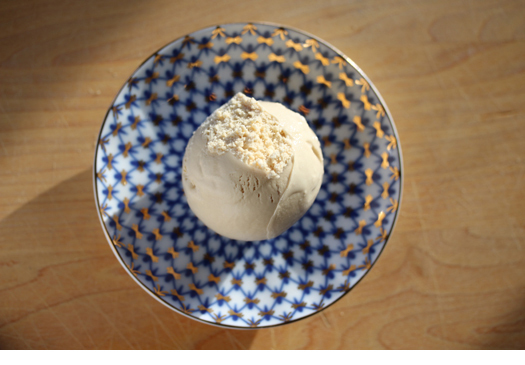 From Anchor Steam Cream to a tasty scoop made with Go West! IPA, Humphry Slocombe’s “ice cream for adults” pushes the boundaries of cold, sweet treats and always delights the taste buds. In a large, heavy-bottomed, nonreactive saucepan over medium heat, combine the stout and brown sugar and cook, stirring often, until reduced by half, 15 to 20 minutes. It should be slightly sticky to the touch. Add the molasses and salt and stir to dissolve the salt. Add the cream and milk and cook, stirring occasionally, until hot but not boiling. Remove the cream mixture from the heat. Slowly pour about half of the hot cream mixture into the yolk mixture, whisking constantly. Transfer the yolk mixture back to the saucepan with the remaining cream mixture and return to medium heat. Cook, stirring constantly with a rubber spatula and being sure to scrape the bottom of the saucepan so it doesn’t scorch, until the liquid begins to steam and you can feel the spatula scrape against the bottom of the pan, 2 to 3 minutes. When the custard has totally cooled, cover the bowl tightly and chill in the refrigerator for at least 1 hour or preferably overnight. When you are ready to freeze the custard, transfer it to an ice cream maker and spin according to the manufacturer’s instructions. Eat immediately or freeze for up to 1 week. If you want to get really crazy, make a beer float with Anchor’s Flying Cloud SF Stout! Find Flying Cloud SF Stout near you using our Beer Finder. If the beer is unavailable nearby, you can substitute with Anchor Porter.